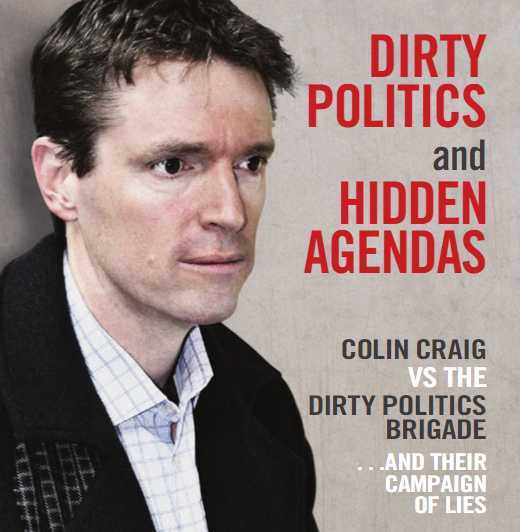 John Stringer and Cameron Slater continue to jointly fight Colin Craig, throwing some Biblical references back at Craig. The first of the 2 major announcements today is the publication of a booklet that outlines the dirty politics agenda and what they have been up to in recent weeks. The first false claim is that I have sexually harassed one or more persons. Let me be very clear I have never sexually harassed anybody and claims I have done so are false. The second false claim being bandied about by the Dirty Politics Brigade is that I have made a pay-out (or pay-outs) to silence supposed “victims”. Again this is nonsense. Again in a similar vein is the false allegation that I have sent sexually explicit text messages or “SEXT’s” as they are known. Once more this is not true. I have never sent a sexually explicit text message in my life. The fourth false claim that we highlight in the booklet and that was being spread about by the Dirty Politics crowd was that of another alleged “victim” of sexual harassment. The second announcement today is that we will be taking legal action for defamation against the Dirty Politics Brigade. It does not serve this country well to have a group of people who influence public opinion through a web of deceit and media manipulation. We identify in the booklet 3 key people in the campaign against me. Each of these will be held to account for the lies they have told. Formal claims are being prepared and I expect these persons will have formal letters from my legal team within the next 48 hours. the ‘Judas’ within the Party. Stringer must have therefore thought it a “Godsend” when the allegations of sexual harassment against Craig began to emerge. We act for Colin Craig and have been instructed by him to prepare defamation proceedings against you. The Bible bashers continue to square off. Both sides seem confident in their righteousness. They can’t all be right.